A few years ago, Felicity moved from her native Australia to set up home with her family in Rome, Italy. She now runs an Art Gallery focussing on weaving, textile and media art, where she also offers creative workshops. Additionally, she has been a writer for 25 years. 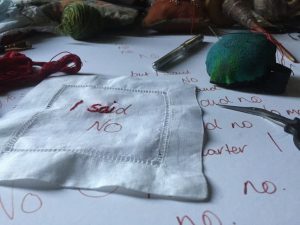 In the last year, she has started work on writing her ‘Fictional’ Memoirs and in parallel a project depicting her story in textile format – weaving words and text into visual textural art. “Opacity rather than communication is the key to my art text. I am enjoy putting the TEXT into Textile. She shares her journey to write her ‘fictional’ memoirs? A group of writers, bloggers, authors, readers and people who love WORDS, where we share tips, ideas and support each other.